When I was six, my family moved into a house with a very large yard in a nice neighborhood with lots of kids. To my incredible delight, next door lived a boy about 14 years old. 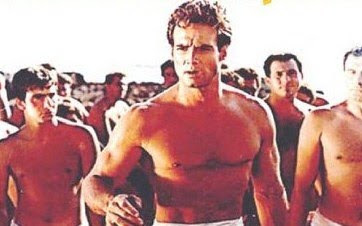 He was a big, tall, strapping, muscular, tanned, shaggy haired blonde, blue eyed, handsome hunk of burning love! Did I say I was six??? I was IN LOVE!!! Everyday, when Greg's bus was due to come down the street, I was already outside waiting, absolutely breathless, with butterflies in my stomach. You know, that electric feeling you get when you're madly, passionately in love? Again, did I say I was six? At first, he was happy to see me when he gallantly hopped off the bus and ran towards me, but then, after a week or so, he became embarrassed as most boys that age do. However, as soon as the bus rounded the corner and was out of sight, he would come bounding out of his house to play with me....or do "homework" together, for which he would invite me over to his house to do. Oh my! A study date! Did I say I was in love and that I was six? Be still, my heart! I would gather up my mimeographed coloring exercise and my little black, bound writing book with the white speckles all over it and go to Greg's to "study". There, I would work hard (tongue out and touching the center of my upper lip) to color and stay "in the lines" and write my name...and his....perfectly in my book while copying his every move. He would put his left hand under his chin...so did I. He stretched his left arm out parallel to his book, so did I. He would pick up a section of the newspaper and "flick" it to read, so did I. Then, he would break down into laughter and take me outside to play. He was the man of my dreams! He knew me inside and out and all of my worldly needs! Did I tell you I was six and in love? MOM! It's not a crush! It's not "puppy love"! 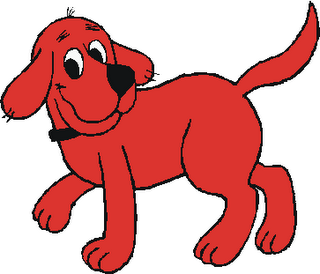 It's a CLIFFORD, THE BIG RED DOG KINDA LOVE!!!!! And ran crying from the room! 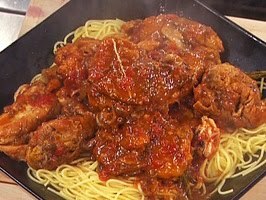 One of my favorite dishes at the time was Chicken And Spaghetti, so my mom used to make it for me when my feelings were hurt (turns out that it was his favorite too). It reminds me of Greg and my huge Clifford, The Big Red Dog stuffed animal that sat on my bed, in the center of my pillows by day, and slept with me at night and the even more humongous crush I had on him. Actually, Greg and I kept in touch through the years and I truly, deeply loved him...we had a special bond, this admiration and respect, that grew out of this puppy love I felt for him and his love for me, the little girl next door. Greg passed away in the early 80's this month. There are a few more stories that I want to share about him, but I'll leave them for later. Cut whole chicken fryer up into pieces. Brown pieces in oil on both sides. If using the tenders and thighs, just brown them, as is, in oil on both sides. Remove from pot. Add chopped vegetables to the pot and saute until wilted. Add sauce and half a jar of water, seasonings and stir. Return chicken to pot and allow to simmer until chicken is cooked thoroughly. Remove chicken from pot and allow to cool. If using cut up pieces, remove meat from bone and tear into bite size pieces. If using boneless pieces, tear or cut into bite size pieces. Return all to pot and allow to simmer while you cook the pasta. Check seasonings and adjust if necessary. Drain pasta and serve! I love the story about your friend Greg being your Clifford.